Hosted by the Government of Mexico City, Mexico, the three-day Habitat III Thematic Meeting on “Financing Urban Development: The Millennium Challenge” concluded with fruitful discussions on solutions for strengthening of municipal finance, as well as identifying strategies for financing urban development policies. The opening ceremony were marked with the presence of Miguel Ángel Mancera Espinosa, Head of Government of Mexico City, and Rosario Robles Berlanga, Minister of Agrarian Territorial and Urban Development, as well as international high-level representatives and local authorities like Denis Coderre, Mayor of Montreal and President of Metrópolis, Mpho Franklyn Parks Tau, Mayor of Johannesburg, and Josep Roig, Secretary-General of UCLG. 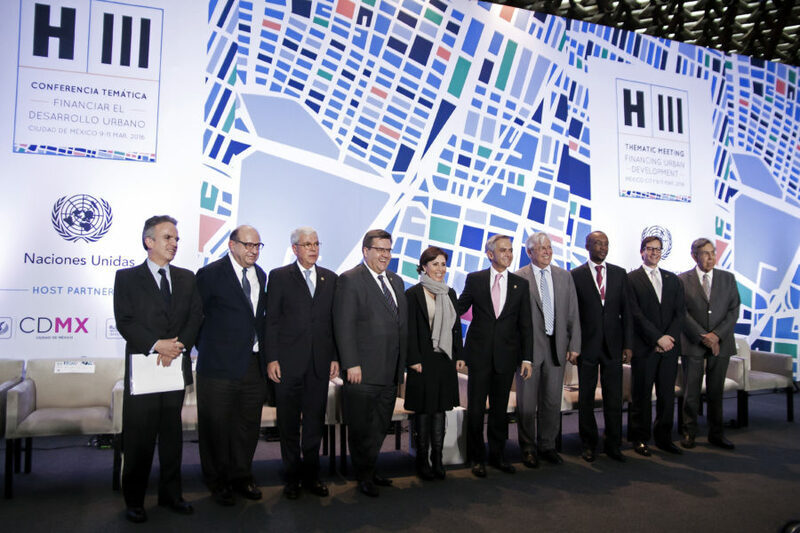 In his remarks, Dr. Joan Clos, Habitat III Secretary-General, highlighted that funding urban development has been conventionally perceived as a cost but that this point of view needs to be radically changed because “financing cities is an investment for the future and for development” as cities generates value themselves and are necessary for national economic growth. Almost 700 participants from five continents representing a wide range of stakeholders— including local, regional, and national governments, civil society, intergovernmental organizations, academy and research institutions, business and private sector, social and solidarity enterprises, community based organizations, philanthropies, women and youth— participated in a bevy of events that included three plenaries, 11 sessions, and 4 parallel events, actively contributing to the elaboration of the Mexico City declaration that will be an important input to the New Urban Agenda. Dr. Kumaresh Misra, Habitat III Deputy Secretary-General, during the closing ceremony underscored the participatory process behind the elaboration of the declaration, citing it as part of a wider effort for the Habitat III process to be as inclusive as it can be toward the Conference in Quito, alongside the regional and thematic meetings all over the world, the national and regional reports, and expert group meetings that led to the development of the Policy Papers. Felipe de Jesús Gutiérrez, Minister of Urban Development and Housing of the Government of Mexico City, also highlighted the drivers of action defined in Mexico City’s Final Declaration: “Localizing finance for inclusive change” including fiscal and financial decentralization; endogenous resources and land-based financing; access to banking, capital markets and innovative financial intermediation; promoting private sector investments and new alliances; financial empowerment, capacity building, transparency and accountability; metropolitan finance and inter-municipality coordination; social and solidarity economy and finance; informal economy and new patterns of consumption and production; climate and resilience finance; social production of habitat and the right to adequate housing for all; Local and regional governments as world actors.